(Product Code: DC20) Create your own custom sized clear acrylic display case, with choice of base, base colour and thickness. 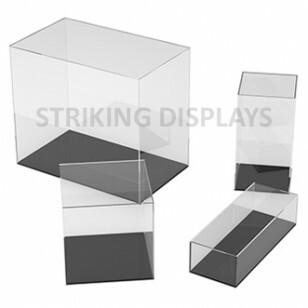 Clear acrylic cube display cases with 6-20mm rebated acrylic base in black, clear or colour options. Made to requirements small to large sizes to fit item to be displayed, using acrylic in a thickness to suit size of case and budget.